If you are a biker, the folding Stowabike 26-inch Mountain Bike is ideal for your casual weekend riding escapades in the city. This folding bike can fit in the trunk of your car and takes up less storage space at home. I have ridden Stowabike 26 mountain bike for about 30 miles both on roads and biking trails. The experience has been great although I was a bit skeptical at first when I imagined riding a folding 18-speed mountain bike. Below is a full review of Stowabike 26 inch dual suspension mountain bike. For those people who like riding often for leisure or exercise, this is the cheap mountain bike for your needs. There’s nothing fancy in this affordable bike. It’s simple, and it may not be the fastest bike you have ridden. Excellent for bike enthusiasts who want a bike that uses less of their car’s trunk and shed space. The stowabike 26-inch folding bike is heavy like other full suspension mountain bikes making it a hard task to fold. It requires some extra energy to maneuver it around while folded, something I consider part of the exercise. This 26″ wheeler has been integrated with the dual suspension system for great performance. This system gives the bike pretty cool looks as well as a tough, rugged and durable exterior. With this bike, you get a complete gratification of having both a folding bike and a mountain bike. You can choose a city road version or a mountain road version to suit your needs. The added suspension fosters traction and reduces the chances of toppling over when on off-road escapades. Although the user manual has a few instructions, this bike is easy and quick to set up. I’m not a pro biker, but I was able to fix everything with ease. The bike also features rear shocks. It would be hard to make use of the shocks though. You will have to attach the bike pedals to their arms, attach the front wheel, the handlebars post, and the seat post. Hope you didn’t dispose accessories from your old bike because they’ll fit into your new stowabike. This Stowabike 26 Folding Dual Suspension Mountain Bike is characterized by 18 speeds with a six-speed grip shifter on the right and the three-speed grip shifter on the left. The location of these shifters allows for a comfort bike ride especially if you have the mountain version. It’s only 39 inches long X 35 inch high X 23.5 inch when folded. It weighs 36 pounds, meaning it is a little bit heavy. It has alloy body spring shocks allowing the bike to support up to 750 pounds so you can comfortably carry your kid around over the weekend. The rear shocks make your ride more enjoyable. The zoom steel suspension fork offers a smooth ride on rugged terrains. I love the way one can assemble everything quickly even without the manual. The bike features an 18-speed gear system which is a rare feature for a bike of a 26″ wheel size. This folding bike uses just a little of your home’s storage space and it can fit onto the trunk of your car comfortably. The user manual is very shallow. Its weight makes maneuvering and carrying it around cumbersome. You may find it difficult increasing the speed on off-road courses. If you are a beginner, it might be quite difficult to assemble. Its plastic rear derailleur pulleys and plastic brake arms are susceptible to damage. The wheels are difficult to release hence it might be inconveniencing sometimes especially when shifting gears. On average, the dual suspension 26-inch Stowabike is a cool bike to maneuver around with it in tight spaces. It cuts through traffic with ease making it ideal for on-road Odes. Its longevity and speed are average making this suitable bike for casual riding. 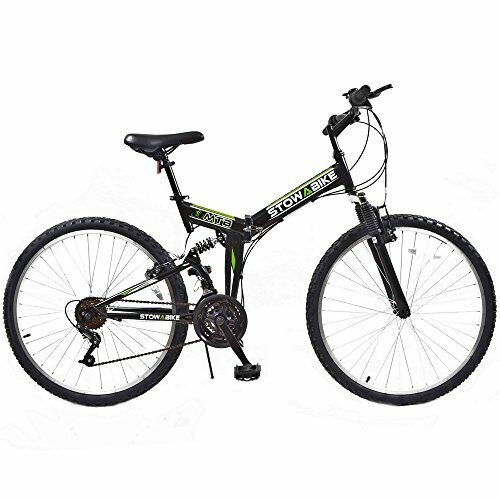 This bike may not meet the needs of an avid biker but it’s a good choice for people who do biking occasionally. This bike is easy to fold up to fit almost anywhere. This is one of the best folding bikes you can get at a fair price. So if you want a bike that will save much of your storage space, this is the right Stowabike for you.